Those shoes are SO flipping cute, well everything, but especially THE SHOOOES! love your super cute necklace!!! I love that dress. I might have to pop over to Modcloth and take a look! Love your flower headband and your cute dress! You look very nice in that outfit. Love the colours in the dress and the shoes are so cute with those little hearts! Seriously-this outfit is perfection. I mean it's everything awesome wrapped into one: Polka dots, hearts, chevrons, and a floral crown! Amazing. Ammmmmazing! I hate to say what everyone else already has but....oh my heavens, those shoes! 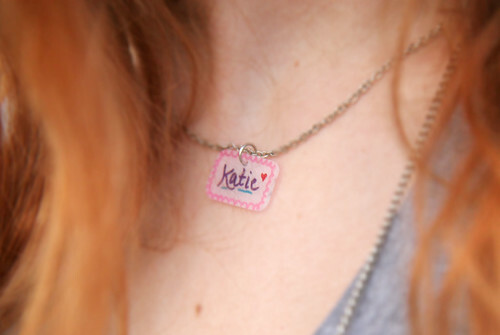 And I love the Katie necklace, too. Is it on shrink plastic? Great outfit! oh my cuteness! Love this whole look! What a darling outfit! I love that flower headband, so beautiful. i mean really...we should play dress swap!? i would love to borrow some of your amazing dresses, and you would look phenomenal in all of my vintage gems! Wow. So pretty! I love your style! carnival = lemonade + funnel cake!!! your dress is charmin', i love the colors! those shoes are the cutest ever! You are seriously the cutest thing ever and those shoes are to-die-for! Love this outfit! Your white polka dot tights are amazing! Those shoes are just about the cutest thing I have ever seen. Your dress is perfect. The end. When I first read this post it made me think of If You Give A Mouse A Cookie! Now I need to read that story to my babes! I love that dress so much!! It is perfection! Thanks for the sweet words, friends! Oh. My. Gosh. That headband is the coolest thing ever. i might just have to make one tonight.